At Dental Center of Jacksonville, Dr. Jignesh Patel places a high priority on ensuring the comfort and satisfaction of his patients. That’s why our team has invested in state-of-the-art technology that helps make your appointments smoother, more accurate, and more relaxed than ever before! Please contact us today to schedule your first appointment, or if you have any questions. Late hours, weekends, and other flexible appointment times are available for the whole family! We don’t want our patients to feel like they’re simply along for the ride when it comes to something as important as their oral health – our goal is to help you become a fully informed partner as you work towards a better, brighter smile! That’s why our doctors use intraoral cameras to capture high-resolution images of teeth and gums; this information (displayed on a convenient monitor) allows us to more clearly explain problematic areas, review the effects of potential treatment options, and much more. 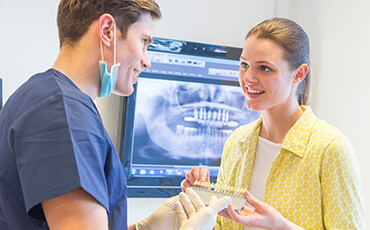 X-rays are a vital part of dental care, helping our Jacksonville, FL team to identify potential concerns that may not be visible on the surface of your smile. To improve the quality of your care, we now offer digital radiography as a vast improvement over traditional film methods. Instead of relying on a darkroom to slowly develop your X-rays, the images are instantly processed and available for viewing in a matter of seconds. They’re also environmentally friendly (no physical storage) and much safer for patients – in the fact, the amount of radiation you’ll be exposed to during the process is reduced by up to 90%. Our team does everything we can to help patients enjoy a painless dental care experience, but for many of them, the mere act of receiving anesthetic (a numbing agent) through a needle can be a frightening and uncomfortable process. Our doctors rely on the DentalVibe to transform this necessary injection for the better. The tool applies a light vibration to the tissue around the affected site, which helps to essentially “block” any feelings of discomfort that might occur due to the injection itself. That’s it! Both children and adults will be suitably numbed before they know it and free to look forward to their healthier, happier smile without fear.